A pedestrian has died after being hit by a fire engine that lost control and overturned while on a 999 call. Mitchell Bailey, 58, died at the crash scene - a roundabout at the junction of York Way and Old North Road in Royston - at 20:45 GMT on Wednesday. Hertfordshire Police said the vehicle was turning right when "for reasons unknown" it lost control. Officers said the four firefighters were left with minor injuries. Two were taken to hospital as a precaution. The house fire which the crew was on its way to was put out by another team, Hertfordshire Fire and Rescue Service said. The county's chief fire officer, Roy Wilsher, said the crash was a "tragic incident". "Hertfordshire Fire and Rescue Service is working with the police to establish exactly what happened and why," he added. 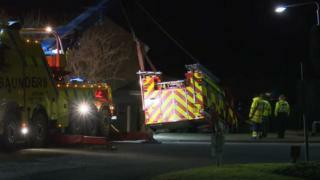 The fire engine has been removed from the scene and is to be examined as part of the investigation, a Hertfordshire Police spokesman said.